The Pixel 2 XL is an expensive smartphone, starting at $849. If you have one, it makes sense to spend a few extra bucks and get your hands on a case that not only protects the device but can also provide more grip and gives it a different look. Of course there are a lot of Google Pixel 2 XL cases on the market already, and more to come. Don’t know which one to choose? Fear not my friend, that’s what this post is for. We’ve compiled a list of the best Pixel 2 XL cases, which you can check out below. While official Pixel 2 XL cases are going to be more expensive, they are arguably of better quality, and some folks just prefer them over 3rd party options. As its name implies, the Pixel 2 XL case is made of fabric that gives it a very trendy look. It has a knit exterior and a soft microfiber liner that will make sure your Pixel 2 XL doesn’t get scratched. The case is compatible with the Active Edge feature that allows you to launch Assistant just by squeezing the sides of the phablet. It has cutouts for the camera, fingerprint scanner, as well as the charging port and sports a silicone G logo on the back. 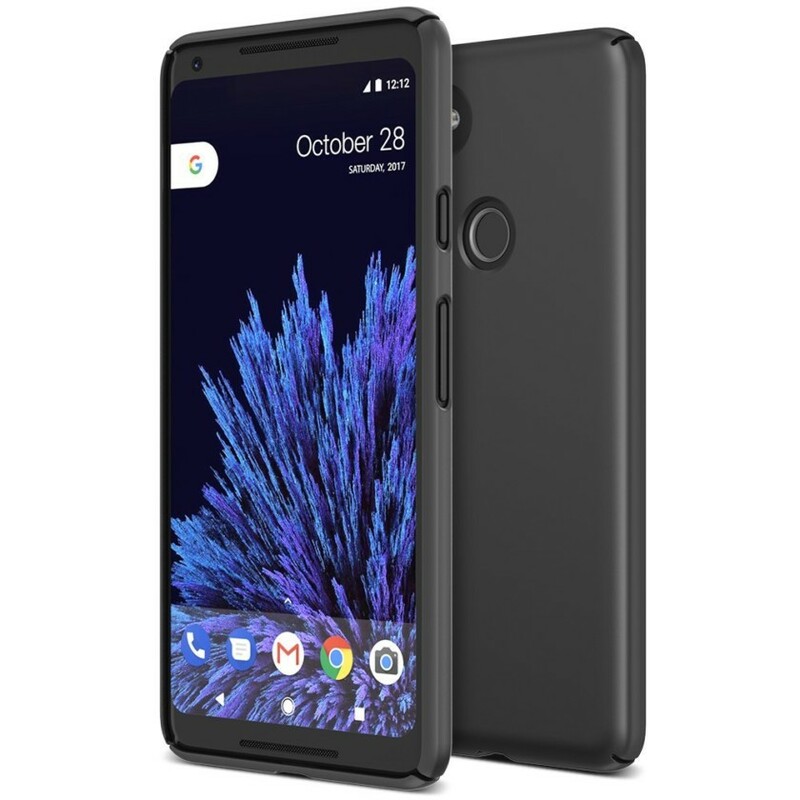 This official Pixel 2 XL case is sold by Google and can be yours for $40. It comes in carbon, cement, midnight, and coral — get it via the button below. Looking for a thin Pixel 2 XL case? There is no thinner case than the MNML Case at just 0.35 mm. Perfect for those of you looking for a minimal case that keeps the look and feel of your Pixel 2 XL. The case comes in five different colors including: clear black, clear white, matte black, really blue and red. It’s on sale for $14.99. Here’s another official Pixel 2 XL case, and a very eye-catching one at that. It features an image/scene from Google Earth and comes with a companion app that updates your wallpaper with a new landscape every day. It’s compatible with the Active Edge feature and has a dual-layer design that should keep your phablet safe from harm. The case weighs almost 50 grams, is made of polycarbonate and TPU, and has a matte finish. You can choose between the “river” and “rock” variants, both of which will set you back $50. The customizable live case from Google is similar to the Earth Live Case, but with one important difference. Instead of choosing a design, you can make one yourself. You can unleash your creativity and make the case unique by customizing it with your favorite photo, while the companion app will turn the wallpaper into a slideshow of your cherished memories. You can also customize the case by choosing from one of the modern artworks by various photographers, illustrators, and artists, or design it using a stylized map of a place that matters to you. Google’s Customizable Live Case is compatible with Active Edge and starts at $40. The problem with putting a case on your phone is you’re covering up the design of the phone itself. It’s for that reason that we particularly like clear slim cases for our phones. The Spigen Liquid Crystal case provides the best of both worlds – protection and it doesn’t cover up your phone’s design. This case is made of flexible TPU material with precision cutouts so you can access your phone’s fingerprint reader. Plus the case is soft enough to allow for Active Edge compatibility. Plus the case itself is very slim, adding only .05mm to the bulk of the phone. At just a hair over $10, that’s a pretty good deal. Spigen’s case is gorgeous and offers more than just the essentials. In addition to keeping your device safe, it also sports a kickstand that comes in handy when you want to watch videos on the device. The Pixel 2 XL case from Caseology is thin and extremely easy on the eyes thanks to its textured geometric pattern. It’s made from TPU and polycarbonate, has a shock absorbing frame, and a raised front lip that keeps the display elevated on flat surfaces. The case has cutouts for the camera, fingerprint sensor, and charging port, features tactile button covers, and provides you with more grip. It’s affordable with its price tag of $13.99 and comes in four colors: navy blue, burgundy, charcoal gray, and ocean gray. This case has a very thin and minimalistic design that doesn’t stand out from the crowd like some of the other products on this list. It’s made from a flex polymer, environmentally certified leather, and a microfiber lining for cushioning. The case has cutouts for the camera, fingerprint scanner, as well as the power and volume buttons on the side. It can be yours in black, navy, caramel, or stone and comes with a three-year warranty for peace of mind. The product is listed on Google’s online store with a starting price tag of $45 — get it via the button below. The Pixel 2XL is a classy looking phone, so you should surround that phone with some additional style. The Maxboost PU leather wallet protects your phone on all sides, easily flipping open when you need to use your phone. Plus, as the name suggests, the case holds up to three cards and even some cash, so it can replace your wallet when you’re out and about. The case closes securely with a magnetic clasp that is a big larger than we generally like to see. But a larger clasp means a more secure closure, so it’s not that bad a trade-off. The case also acts as a kickstand for hands free media consumption. Kick back and take in your favorite episode of Stranger Things and let this case do the work. You can pick it up for less than $15 on Amazon. Maxboost’s case protects your Pixel 2 XL without adding too much bulk. It’s made from polycarbonate, has all the necessary cutouts, and sports a raised lip that protects the screen of the device. The case features a shock-absorbing frame and a very minimalistic design that’s still easy on the eyes. It has a matte-finish coating that provides a great grip, and comes with a lifetime warranty. The black version of the product retails for $11.99 on Amazon, while the pink and mint versions can be yours for $12.99. The last Pixel 2 XL case on this list is also the most rugged. It provides a lot of protection thanks to its dual-layered casing with a polycarbonate hard shell exterior and soft silicone interior. The product has all the required cutouts and comes with a 180-degree rotating belt clip. It also has a built-in kickstand that enables hands-free viewing and is backed by a lifetime warranty. The case can be yours in black or blue with the former retailing for $11.99, while the latter will set you back $10.99. Of course, if you’re looking for something that has multiple features, you could take a look at the Spigen Slim Armor Wallet case. This is a rugged case that adds a lot of protection and bulk to your Pixel 2XL. But the bulk it adds isn’t wasted as the case also features a compartment that can hold two cards, such as a driver’s license and credit card. This way it can act as a wallet case and as a rugged protector. Normally, we wouldn’t recommend this case, seeing as how it adds a lot of bulk to the phone. But, we’ve come across a few variations of this style of case, specifically relating to the Pixel 2XL so there must be something to it. We’ll try to get our hands on one to give it a thorough review and update this post when we can. There are a number of Pixel 2 XL cases out there, but these are our top picks. They fit just about any budget, as they range from around $12 to $130. Which Pixel 2 XL case is your favorite? Let us know in the comments.